Since the time its inception in 1990, applications of augmented reality have evolved to the great extent. Be it any field, sports, architecture, tourism, navigation, etc. the transformative impact of augmented reality on these industries have simplified the operation, in the context of accuracy and processing time. And augmented reality in a medical field is no exception to it at all! What is augmented reality and how is it different from virtual reality? Augmented reality can be referred to be as the modified interactive experience of the real world that has been magnified through computerized perceptual information. Multiple times the information is processed through the integration of a number of sensory modalities including audiovisual, haptic, olfactory as well as somatosensory integration. The virtual reality can also remarkably alter our visual perception, but the only difference between the virtual reality as well as augmented reality is that the former one can take us to the different world altogether; whereas the latter can only magnify our visual perception. In a simpler language, if you wish to identify the actual difference between the two; you can think about the scuba diving and visiting an aquarium. With the application of virtual reality, you would be able to swim with sharks; however, in the case of augmented reality, you can just watch them popping out of the tank. 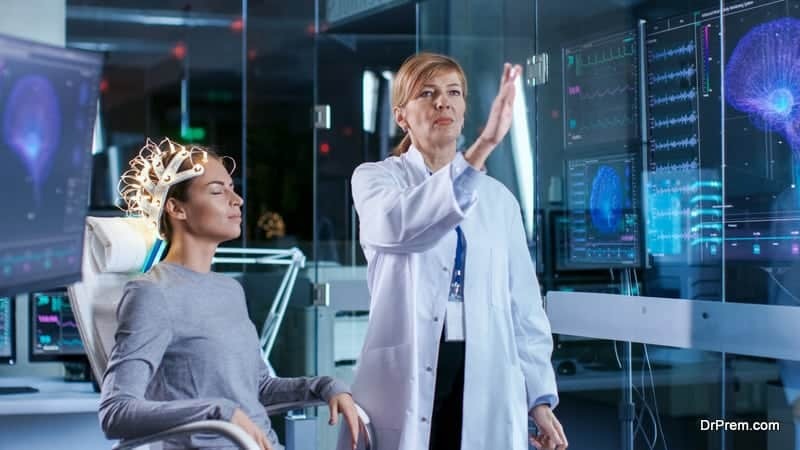 The strong broadcasting potential of the augmented reality has been proven to play a crucial role in the healthcare industry as well. Only after a couple of years of its implementation in the medicinal world, the augmented reality has created a definitive market that is expected to reach to 660 million $ by the end of 2018. 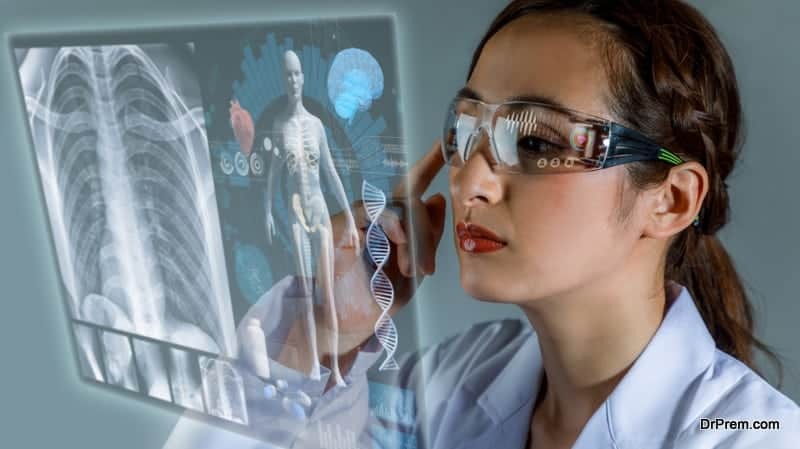 Scientists are now trying to sync quick and easy access to the data and latest news to the doctors with the future of augmented reality in healthcare. Accordingly, if the patient is lying in the OT and the surgeon has to confirm his/her past allergies to certain medication; he can quickly get the information through his AR screen, instead of scrolling through his entire file. Besides, augmented reality in a surgery can be extensively applied for screening and locating patient’s veins, and different important organs for more accurate performance. 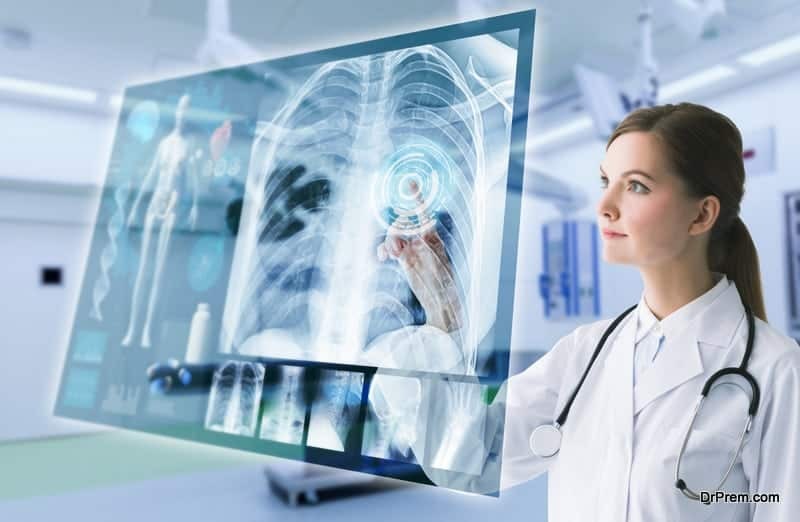 Thus, the application of augmented reality in a medical field can be helpful for both medical experts and paramedical staff for faster data access and quicker health-related decisions. Undoubtedly the augmented reality has transformed our visual perception and the way of interaction, quite significantly in today’s world. Similarly, augmented reality in a medical field has offered countless benefits. Augmented reality in a medical field has been helpful in offering a detailed look at the complicated human anatomy for a better understanding of medical students. Besides, the device can be placed on to the human body, and within no time all the information related to anatomy, internal organs, structural as well as functional attributes can be extracted in the form of audios as well as videos. The same can be circulated for training purpose. The manikins created through AR applications have been very popular recently among medical students for self-training. 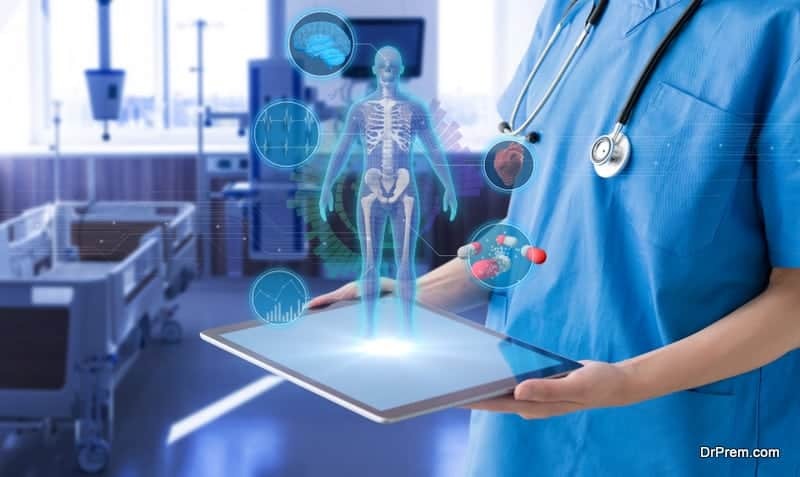 AR has thus certainly revolutionized the medical education due to its potential to provide 3D information of human body. AR is helping doctors to perform different surgeries with great accuracy. Doctors don’t have to put an extra effort to locate veins particularly in the case of aged patients. In the case of cancer surgeries, AR can offer guidance related to its metastasis, tumors and can even indicate internal bleeding; and thereby can increase the chances of survival. 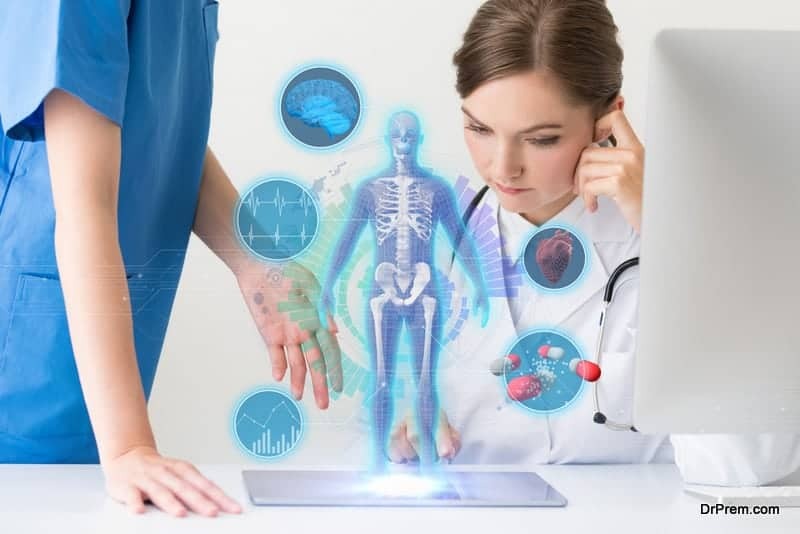 The augmented reality in a medical field is being considered to be the important platform for offering effective pain management by diverting attention and exposing to the 3-dimensional world of the human body. For example, interactive visualization of the proposed information can be interesting for a woman to minimize her labor pain during labor. Accuvein is the handheld AR device that is being designed and constructed with an intention to visualize a patient’s network of the vein through illumination. The application of AR device in the healthcare industry is highly endorsed by doctors and nurses due to its ability to improve visual perception for the location of the vein in the first instances. The device is found to be helpful in offering approximately 3.5 times better accuracy in locating a specific vein. Augmented Reality in the medical world has been successfully applied in the creation of Inner Optic Magic Loupe. The device utilizes a combination of both electromagnetic radiation as well as ultrasound technology that is focused on the AR glasses to offer guidance to needles towards their prescribed locations in the body. Conventionally done only with ultrasound technology, this latest tool has been proven to be helpful in improving procedural accuracy through better hand and eye coordination. Considering the crucial services offered by the healthcare industry, it is important for the manufacturers and pharmaceutical suppliers to avoid batch to batch variation for all the raw material. In this regard, an implementation of light guide AR system can offer the accurate guidance to the operator through a series of easy to understand tutorials. The application of such type of augmented reality in the medical world can result in consistent high-quality production, avoid batch wise variation, reduce production time with great returns. Moreover, the system can be helpful in creating a digital birth certificate to every product that is being manufactured for easy and hassle-free tracing. In the current situation, it is almost impossible for every doctor to attend millions of patients at one point of time. The access to the medical facility has been tremendously limited due to unavailability of experts, paramedical staff such as nurses and medicines. The concept of telemedicine or virtual consultation has allowed easy medical consultation using smart AR devices. The Proximie app has been very popular in this regard, due to its easy connectivity to specialists, further allowing virtual consultation over distance.